Port Dover has welcomed visitors here for generations and is a place to visit where you can close your eyes and imagine history coming alive. Take a stroll along the pier to the lighthouse, shop in many of the unique shops lining the pier or let the water tickle your toes while kids of all ages build sand castles along the beach. When you visit Maple Court Cottages you will discover that the little town of Port Dover has it all for either a day-trip or a relaxing extended getaway. Here are a few ideas of what to see and do while you are here. Many of our restaurants serve world famous Lake Erie perch and pickerel like the Erie Beach Hotel or go to David’s Restaurant and enjoy a scrumptious lunch/dinner overlooking Lake Erie. Try their Double Olive Martini Lounge where you can sample one of the many specialty martinis. For a change of pace, you can treat yourself to “A day at the beach spa” and be pampered and rejuvenated at the Elements Day Spa. The Lynn Valley Trail Association offers you 9 km. of hiking and biking trails passing through a number of different habitats including; mixed woods, wetlands, open grassland and agricultural land, all along the scenic Lynn River. There are 4 original trestle bridges which have been reinforced and decking and railings built. The addition of benches, picnic tables, a portable washroom, fencing and signage have made the trail a comfortable and safe area for walking, hiking, cycling or nature study. Evergreen Hill Farm Hay and Sleigh Rides offers horse & Carriage rides for Weddings, etc., horse drawn sleigh and hay rides & and maple syrup runs in the Spring. Groups of 15 people or more can be accommodated. Contact Scott Sowden at 519-426-2155 or email him sowden@kwic.com for more information and pricing. 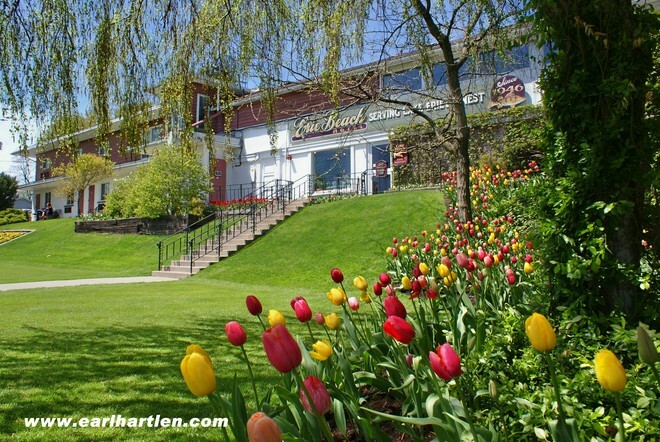 Take a drive to Whistling Gardens in Wilsonville and stroll around their beautiful garden centre. They offer a full line of ornamental deciduous trees including several hard to find Carolinian species and exotic trees rarely offered to the public. They are open 7 days a week throughout the summer! Scuba Diving and Charters – Looking to dive a famous Lake Erie shipwreck or charter a boat, contact Waypoint Marine and Scuba. If you wish to bring your own boat, contact Hoover’s Marina & Wharfside Restaurant at 519-587-2776. They offer two boat ramps, trailer & boat storage, overnight transient slips, fuel navigation charts and bait. Sip a cold drink on the patio and enjoy the view. This has all the charm of an east coast setting. Fishing charters can be arranged through Jimmy Riggin’ Fishing Charters in Port Rowan. Just phone him at 519-586-7990 or email him at info@jimmyriggin.com. Boat ramp, pontoon boat charters, canoe rentals, rowboat rentals & live bait “At the Bridge” in Long Point. Call Richard Cronmiller @ 519-586-7033 or cell: 519-802-6267 or email him at cronmillersatthebridge@hotmail.com. 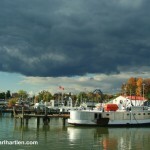 Learn to Sail in Port Dover! Check out the Port Dover Yacht Club Sailing School for more information at 519-583-3745. They offer youth summer camps and adult sailing classes. 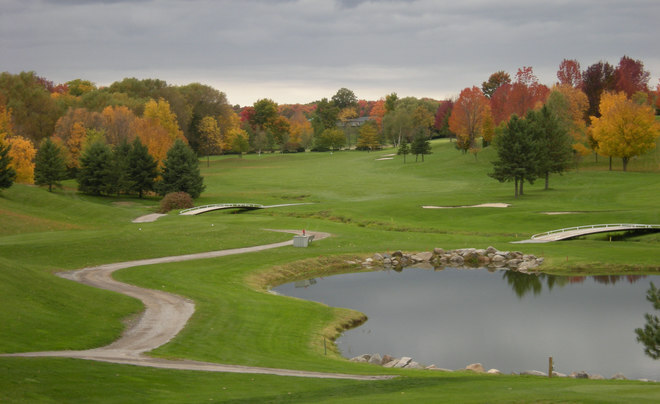 You will find numerous quality golf courses in and around Port Dover. 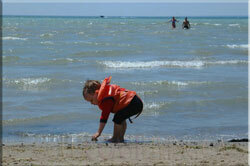 Check out the annual festivals and special events in Port Dover. Entertainment – See what live theatre performances are showing at the Lighthouse Theatre. Get details for Friday 13th events. Click on Video. For fresh water Scuba diving at Long Point, Lake Erie. Zip lining – Long Point Eco-Adventures invites you to come out for an afternoon of ziplining. They are located on Front Road between St. Williams and Turkey Point about 1/2 hour drive away from our cottages so get ready for a lot of fun! Besides the canopy tour, they also offer canoeing, kayaking, walking trails, mountain biking and an observatory. Check out their website or call 1-877-743-TOUR. Horseback riding – Black Creek Stables – The Best in Western Trail Riding is located about 3 miles from our cottages on Regional Road #3. Check out their website or call Robert & Connie Mason @ 519-583-2198 for details and rates.